Juventus interested in Chelsea defender? 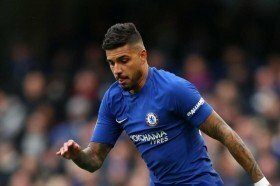 Juventus are reportedly planning an attempt to lure Emerson Palmieri from Chelsea as they seek to bolster their squad for the second half of the season. Emerson joined the Blues from Roma during the 2018 winter transfer window but he has struggled for gametime with just 14 starts in all competitions. According to Calciomercato, the Bianconeri are understood to have an eye on the former Roma man and they may seek to pursue him to offer depth behind left-back Alex Sandro in their ranks. Emerson has featured in the left-back role at Chelsea whenever Marcos Alonso has required a rest but chances have been few and far between to satisfy him. At present, the Blues possess the services of Davide Zappacosta, who can also slot into the left side of the defence and it will be interesting to see whether they are tempted to sanction Emerson's departure. Similarly to Emerson, Zappacosta has largely featured in the Cup and European competitions this term and he has recently been linked with a potential move to Lazio.